Starting on September 1st 1939 with Nazi Germany’s attack against Poland, World War Two gradually sucked into its direful vortex 61 countries – in other words – 80% of the entire population of the world. Its fire-brandishing tornado swept across vast territories of Europe, Asia and Africa, engulfing oceanic expanses, reaching the shores of Alaska and Novaya Zemlya – in the north, the Atlantic coast – in the west, the Kuril isles– in the east, the borders of Egypt, India and Australia — in the south. World War Two not only predetermined the fate of individual states and peoples, but whole continents, too. One of the indisputable results of our victory was that its aftershocks dealt a blow to the colonial system that existed for 400 years and to a great extent determined the existence of Asia, Africa and Latin America, leading to its collapse. This is why victory in that war was, without a doubt, an event of profound geopolitical magnitude. The most significant events and decisive battles of that war unfolded on the territory of our country. Our people carried the brunt of the hardships the war brought with it. We paid dearly for the long-awaited victory – World War Two claimed 27 million lives of our compatriots. Here are recollections of how the war started, shared by some of the young teenage Muscovites, who were later destined to experience the brunt of the hardships that befell our Homeland. For war against our country the German command had elaborated the “Barbaross”. “Barbaross” means ‘red bearded’. This was the nickname of Emperor Friedrik I, whose rule fell on the years 1150 – 1190. It wasn’t accidental that his nickname was borrowed for the plan. This was an allusion to the former imperial might of the German nation, that in its time had rallied Europe into a unity and ruled it, in one way or another, for several centuries. Forming the strategic basis of the “Barbaross” plan was the theory of the ‘blitzkrieg’, or ‘lightning-quick’ war, which served its purpose so well in the war in the West. The plan presupposed an annihilation of Russia in the course of a swift campaign to last a maximum of five months. Acknowledged as the principal strategic objectives were Moscow, Leningrad, the Central industrial region and Donetsk coal-fields. The operation to seize Moscow stood apart. In the final count it was believed that with the capture of Moscow the entire war would have been won. Hitler’s command was so sure the “Barbaross” plan could never fail, that approximately as of spring 1941 they began elaborating further plans of assuming world supremacy. In the logbook of the Wehrmacht Supreme Headquarters there is an entry on February 17th 1941 stating Hitler’s demand that “…after the end of the eastern campaign it is imperative to make provisions for the capture of Afghanistan and organize an assault against India.” In India it was planned to close ranks with the allied Japanese forces. Stemming from these directives by Hitler, the Supreme headquarters embarked on elaborate planning of future Wehrmacht operations. After the defeat of the Soviet Armed forces the plan presupposed the capture of English colonial territories and a number of independent countries in the Mediterranean, in Africa, and in the Middle East. As a follow-up to this came the incursion into the British Isles and unfolding military action against America. Afterwards, jointly with Japanese militarist circles they nurtured plans of seizing the entire American continent. According to the Nazis, the keystone to these ambitious plans of world dominance was the success of the blitzkrieg against our country – the USSR at the time. Around 4 a.m. in the morning on June 22nd 1941 Nazi Germany, in breach of the existing non-aggression pact between it and the USSR, lasting ten years, violated the borders of our country. This country was dealt a mighty blow from an accumulated force of 190 divisions, numbering almost 5 million troops, thousands of tanks, guns and machine-guns, planes, and almost 250 ships. The “Barbaross” plan presumed a surprise attack along several directions with the use of tank, mechanized divisions and aviation, with the purpose of disengaging, surrounding and destroying the main forces of the Red Army, located in the western part of the USSR. Afterwards, plans presupposed a swift incursion inland. On a vast area of the frontline – from the Barents Sea in the north-west to the Black Sea in the south there unfolded a spate of borderline battles. The enemy was much stronger. Besides, they had the added advantage of a surprise attack. This is why at the outset of the war the Red Army was always on the defensive, and forced to retreat instead of attempting to advance. However, even in these conditions, there were frequent manifestations of true valor. Even after a month of fighting, the Brest fortress held out, engaging a significant part of the enemy’s forces and wearing them out. As for Major Gavrilov, the Germans were only able to seize him on the 33rd day, wounded and shell-shocked. They looked at him in stunned admiration, for he was all covered in blood-soaked bandages and could barely stand… The Major’s incredible heroism produced so great an impression on them they decided against executing him, and instead took him prisoner. Luckily, Major Gavrilov survived and was able to return home after he was liberated. Eight days after the beginning of the war, on June 30th, the State Defense Committee was summoned to take on complete responsibility for all state affairs. It was chaired by Joseph Stalin. The Committee adopted a directive for all near-frontline regions. This was a combat program of action of our people in the Great Patriotic War, a program of mobilization of all material and spiritual resources of the country for the purpose of defeating the enemy. Our Motherland is in grave danger. This is a case of life and death for our Soviet state, the peoples of the USSR; our free and independent existence is placed on the line. We must immediately convert our entire life and work onto military rails, with the interests of the front coming first and foremost in all matters, with the sole purpose of crushing the enemy. As Stalin was saying these words, the enemy had already seized Lithuania, part of Latvia, Byelorussia and Ukraine. The principal event of those days was the defensive battle on the outskirts of the western Russian town of Smolensk. The relentless resistance of our forces in this battle forced the enemy to revert to defense tactics. Thus, Hitler’s plan of a lightening-swift war was entirely frustrated. However, our country paid a heavy price for this in almost 310 thousand dead and captured. In the Far North the German army group “Norway” was streaking towards Murmansk, yet was stopped in its tracks. The frontline here was stable right to the end of the war. Moreover, in certain areas the enemy never did cross our border. 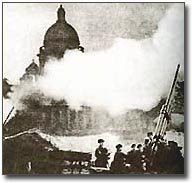 In the North-West the enemy’s principle target was Leningrad (initially, and today – St.Petersburg). 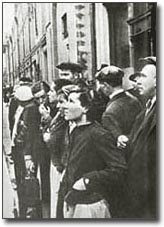 The German army group “North” laid siege to Leningrad in early September 1941, isolating it from the rest of the country. All that was left was the so-called ‘road of life’ across Lake Ladoga, along which Russia’s Northern capital received the help it was in vital need of. On the city’s northern side, Hitler’s allies – the Finnish forces had laid siege. Thus, there began the 900-day long siege of Leningrad that claimed 800,000 lives. In the south the Germans, despite the stubborn resistance of our troops, seized Kiev, besieged Odessa, cut into the Crimea and laid siege to Sebastopol. The defenders of these cities fought stoically. Odessa had to be surrendered, with the troops redeployed from there to Sebastopol. Scoring such major successes, on September 30th 35 German divisions launched an operation to seize Moscow. 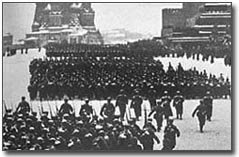 The enemy succeeded in breaking through to Moscow, yet their advance was temporarily cut short by the Red Army. In November the enemy renewed the attempt to seize Moscow. Hitler’s army bombed Moscow incessantly. Yet, there was no panic in the city. There was strict order. Everyone who could participated in the defense effort. The partisans were also actively fighting the enemy. “Comrades, we are forced to mark the 24th anniversary of the October revolution in severe circumstances… We have temporarily lost a number of regions. The enemy is on the very threshold of Moscow and Leningrad… However, despite our temporary failures, our army and Navy are rebuffing the onslaughts of the enemy along the entire length of the frontline, incurring their severe losses. Our country is one united combat unit, acting jointly with our army and fleet to secure a decisive victory over the German invaders. Straight from the parade the troops went off to the frontline — to fight for Moscow. And we won that battle! As Russia’s great Marshal Georgy Zhukov, one of those to whom we owe our victory in the battle of Moscow, later recalled, our reconnaissance units had done an excellent job. They managed to glean information as to where the principal onslaught on Moscow would be coming from. It was in that direction that the defense lines were particularly reinforced. “Hitler’s troops, of course, never anticipated such strong resistance on our part,” Georgy Zhukov said of the battle of Moscow. “Moreover, the further they advanced, the more dogged and resolute this resistance was. And by the time the enemy ventured onto the approaches to Moscow, understandably, every single person of ours put up an even greater resistance. The enemy’s losses were growing with rapid speed. In actual fact, they lost some of their best here… The Nazis suffered tremendous losses without anything to show for it. They had miscalculated, thinking we were incapable of defending our capital. And they had overestimated their own strength.